At the turn of the 19th century, there were approximately one million rhinos. In 1970, there were around 70,000. Today, there are fewer than 24,500 rhinos surviving in the wild. Three of the five species of rhino are “Critically Endangered” as defined by the IUCN (World Conservation Union). A taxon is classified as critically endangered when the best available evidence indicates that it meets any of a range of pre-determined criteria. It is therefore considered to be facing an extremely high risk of extinction in the wild. The southern subspecies of the white rhino is classified by the IUCN in the lesser category of being “Near Threatened”; and the Indian rhino is classified as “Vulnerable”even this is considered to be facing a high risk of extinction in the wild. In 2005, some of us are lucky enough to be able to travel to Africa and Asia to see them in the wild. In 2035, when our children and grandchildren have grown up, will they still be able to see wild rhinos? Rhinos have been an important part of a wide range of ecosystems for millions of years; we must not let them join the dodo in extinction. Poachers kill rhinos for the price they can get for the horns (used for traditional Chinese medicine and for ornamental dagger handles in Yemen); land encroachment, illegal logging and pollution are destroying their habitat; and political conflicts adversely affect conservation programmes. When protecting and managing a rhino population, rangers and scientists take in account all the other species interacting with rhinos and those sharing the same habitat. When rhinos are protected, many other species are too; not only mammals but also birds, reptiles, fish and insects as well as plants. 5. Rhinos are charismatic mega-herbivores! By focusing on a well-known animal such as a rhino (or, to use the jargon, a charismatic mega-herbivore), we can raise more money and consequently support more conservation programmes benefiting animal and plant species sharing their habitat. 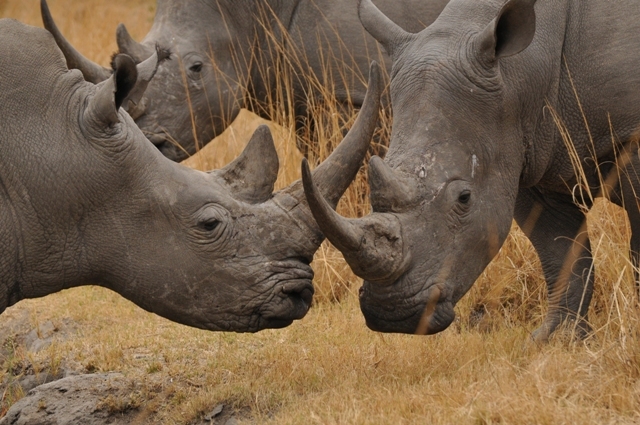 Rhinos are the second-biggest living land mammals after the elephants. Together with lion, giraffe, chimpanzee and polar bear, the rhino is one of the most popular species with zoo visitors. In the wild, rhinos attract tourists who bring money to national parks and local communities. They are one of the “Big Five”, along with lion, leopard, elephant and buffalo. Protecting and managing a rhino population is a real challenge that costs energy and money. Rhino-range countries need our financial support, and benefit from shared expertise and exchange of ideas. We know that conservation efforts save species. The Southern white rhino would not exist today if it were not for the work of a few determined people, who brought together the 200 or so individuals surviving, for a managed breeding and re-introduction programme. Today, there are some 17,500 Southern white rhinos. With more money, we can support more programmes, and not just save rhino populations, but increase numbers and develop populations. The Northern white rhino subspecies may just have become extinct, but it is not too late to save the rest. Not just that, but how many people know that rhinos also live in Asia? Or that two species have just one horn? Or that the horn is not used as an aphrodisiac? We have even heard some people say that they are carnivores! If people do not know about these amazing animals and the problems they are facing, how can we expect them to want to do something to help save rhinos? 10. We all have an opportunity to get involved! You can help us raise awareness of the plight of the rhino! The more we do all together, the more people will learn about rhinos and the more field projects we will be able to support. There are lots of fundraising ideas scattered in the ‘Support us’ section, as well as ways to donate directly to Save the Rhino. And there are rhino-themed games and puzzles in the ‘Rhino info’ section.